How do you use Auto Layout within UITableViewCells in a table view to let each cell's content and subviews determine the row height (itself/automatically), while maintaining smooth scrolling performance? The first 2 steps below are applicable regardless of which iOS versions you are developing for. Getting your constraints right is definitely the hardest and most important part of getting dynamic cell heights working with Auto Layout. If you make a mistake here, it could prevent everything else from working -- so take your time! I recommend setting up your constraints in code because you know exactly which constraints are being added where, and it's a lot easier to debug when things go wrong. Adding constraints in code can be just as easy as and significantly more powerful than Interface Builder using layout anchors, or one of the fantastic open source APIs available on GitHub. If you're adding constraints in code, you should do this once from within the updateConstraints method of your UITableViewCell subclass. Note that updateConstraints may be called more than once, so to avoid adding the same constraints more than once, make sure to wrap your constraint-adding code within updateConstraints in a check for a boolean property such as didSetupConstraints (which you set to YES after you run your constraint-adding code once). On the other hand, if you have code that updates existing constraints (such as adjusting the constant property on some constraints), place this in updateConstraints but outside of the check for didSetupConstraints so it can run every time the method is called. For example, if you were displaying an email message in each cell, you might have 4 unique layouts: messages with just a subject, messages with a subject and a body, messages with a subject and a photo attachment, and messages with a subject, body, and photo attachment. Each layout has completely different constraints required to achieve it, so once the cell is initialized and the constraints are added for one of these cell types, the cell should get a unique reuse identifier specific to that cell type. This means when you dequeue a cell for reuse, the constraints have already been added and are ready to go for that cell type. Note that due to differences in intrinsic content size, cells with the same constraints (type) may still have varying heights! Don't confuse fundamentally different layouts (different constraints) with different calculated view frames (solved from identical constraints) due to different sizes of content. Do not add cells with completely different sets of constraints to the same reuse pool (i.e. use the same reuse identifier) and then attempt to remove the old constraints and set up new constraints from scratch after each dequeue. The internal Auto Layout engine is not designed to handle large scale changes in constraints, and you will see massive performance issues. What this does is provide the table view with a temporary estimate/placeholder for the row heights of cells that are not yet onscreen. Then, when these cells are about to scroll onscreen, the actual row height will be calculated. To determine the actual height for each row, the table view automatically asks each cell what height its contentView needs to be based on the known fixed width of the content view (which is based on the table view's width, minus any additional things like a section index or accessory view) and the auto layout constraints you have added to the cell's content view and subviews. Once this actual cell height has been determined, the old estimated height for the row is updated with the new actual height (and any adjustments to the table view's contentSize/contentOffset are made as needed for you). Generally speaking, the estimate you provide doesn't have to be very accurate -- it is only used to correctly size the scroll indicator in the table view, and the table view does a good job of adjusting the scroll indicator for incorrect estimates as you scroll cells onscreen. You should set the estimatedRowHeight property on the table view (in viewDidLoad or similar) to a constant value that is the "average" row height. Only if your row heights have extreme variability (e.g. differ by an order of magnitude) and you notice the scroll indicator "jumping" as you scroll should you bother implementing tableView:estimatedHeightForRowAtIndexPath: to do the minimal calculation required to return a more accurate estimate for each row. First, instantiate an offscreen instance of a table view cell, one instance for each reuse identifier, that is used strictly for height calculations. (Offscreen meaning the cell reference is stored in a property/ivar on the view controller and never returned from tableView:cellForRowAtIndexPath: for the table view to actually render onscreen.) Next, the cell must be configured with the exact content (e.g. text, images, etc) that it would hold if it were to be displayed in the table view. Then, force the cell to immediately layout its subviews, and then use the systemLayoutSizeFittingSize: method on the UITableViewCell's contentView to find out what the required height of the cell is. Use UILayoutFittingCompressedSize to get the smallest size required to fit all the contents of the cell. The height can then be returned from the tableView:heightForRowAtIndexPath: delegate method. If your table view has more than a couple dozen rows in it, you will find that doing the Auto Layout constraint solving can quickly bog down the main thread when first loading the table view, as tableView:heightForRowAtIndexPath: is called on each and every row upon first load (in order to calculate the size of the scroll indicator). As of iOS 7, you can (and absolutely should) use the estimatedRowHeight property on the table view. What this does is provide the table view with a temporary estimate/placeholder for the row heights of cells that are not yet onscreen. Then, when these cells are about to scroll onscreen, the actual row height will be calculated (by calling tableView:heightForRowAtIndexPath:), and the estimated height updated with the actual one. If you've done all the above and are still finding that performance is unacceptably slow when doing the constraint solving in tableView:heightForRowAtIndexPath:, you'll unfortunately need to implement some caching for cell heights. (This is the approach suggested by Apple's engineers.) The general idea is to let the Auto Layout engine solve the constraints the first time, then cache the calculated height for that cell and use the cached value for all future requests for that cell's height. The trick of course is to make sure you clear the cached height for a cell when anything happens that could cause the cell's height to change -- primarily, this would be when that cell's content changes or when other important events occur (like the user adjusting the Dynamic Type text size slider). These projects are fully working examples of table views with variable row heights due to table view cells containing dynamic content in UILabels. 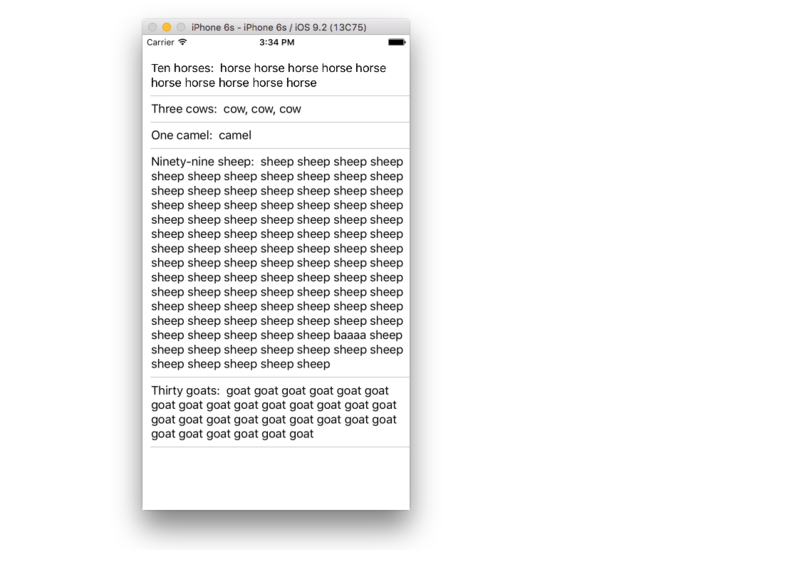 If you're using Xamarin, check out this sample project put together by @KentBoogaart. If multiple lines labels, don't forget set the numberOfLines to 0. The full example code is here. William Hu's Swift answer is good, but it helps me to have some simple yet detailed steps when learning to do something for the first time. 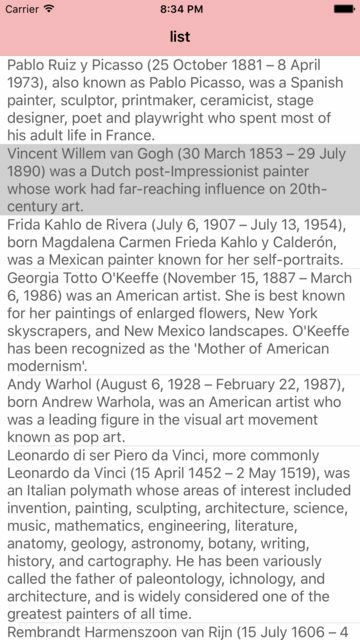 The example below is my test project while learning to make a UITableView with variable cell heights. I based it on this basic UITableView example for Swift. It can be just a Single View Application. Add a new Swift file to your project. Name it MyCustomCell. This class will hold the outlets for the views that you add to your cell in the storyboard. In this basic example we will only have one label in each cell. Add a Table View to your view controller and use auto layout to pin it to the four sides. Then drag a Table View Cell onto the Table View. And onto the Prototype cell, drag a Label. Use auto layout to pin the label to the four edges of the content view of the Table View Cell. Auto layout works together with the important two lines of code I mentioned above. If you don't use auto layout it isn't going to work. 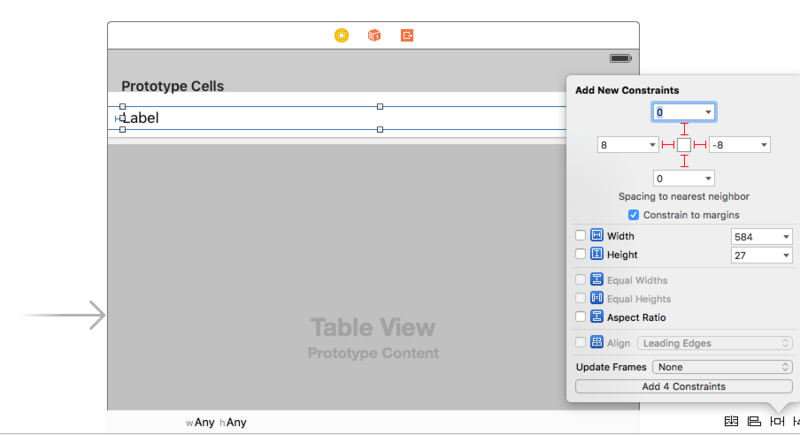 Select the Table View Cell and set the custom class to be MyCustomCell (the name of the class in the Swift file we added). Also set the Identifier to be cell (the same string that we used for the cellReuseIdentifier in the code above. 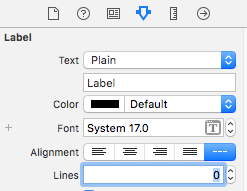 Set the number of lines to 0 in your Label. This means multi-line and allows the label to resize itself based on its content. 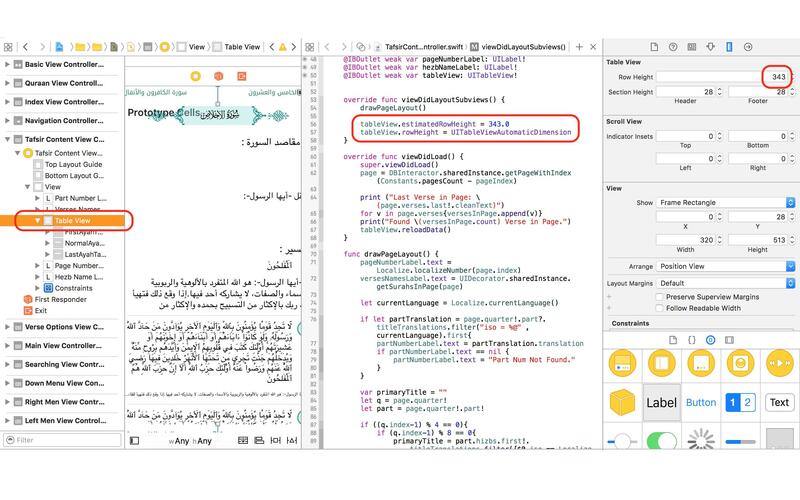 Control drag from the Table View in the storyboard to the tableView variable in the ViewController code. Do the same for the Label in your Prototype cell to the myCellLabel variable in the MyCustomCell class. You should be able to run your project now and get cells with variable heights. This example only works for iOS 8 and after. If you are still needing to support iOS 7 then this won't work for you. Your own custom cells in your future projects will probably have more than a single label. Make sure that you get everything pinned right so that auto layout can determine the correct height to use. You may also have to use vertical compression resistance and hugging. See this article for more about that. I decided to wrap this clever solution by @smileyborg into a UICollectionViewCell+AutoLayoutDynamicHeightCalculation category. It doesn't take into account any caching but suits my needs right now. Feel free to copy, paste and hack at it. Thankfully we won't have to do this jazz in iOS8, but there it is for now! Here is my solution. You need to tell the TableView the estimatedHeight before it loads the view. Otherwise it wont be able to behave like expected. The solution proposed by @smileyborg is almost perfect. If you have a custom cell and you want one or more UILabel with dynamic heights then the systemLayoutSizeFittingSize method combined with AutoLayout enabled returns a CGSizeZero unless you move all your cell constraints from the cell to its contentView (as suggested by @TomSwift here How to resize superview to fit all subviews with autolayout?). To do so you need to insert the following code in your custom UITableViewCell implementation (thanks to @Adrian). Mixing @smileyborg answer with this should works. An important enough gotcha I just ran into to post as an answer. It confounded me for awhile. Then I realized it's because those are only triggering layoutSubviews on the contentView, not the cell itself. Note that if you are creating a new cell, I'm pretty sure you don't need to call setNeedsLayout as it should already be set. In cases where you save a reference to a cell, you should probably call it. Either way it shouldn't hurt anything. (I happen to cache this particular cell for re-use, but that's irrelevant). As long as your layout in your cell is good. Update: You should use dynamic resizing introduced in iOS 8. Interface Builder does not handle auto-sizing cell set-up properly. Even if your constraints are absolutely valid, IB will still complain and give you confusing suggestions and errors. The reason is that IB is unwilling to change the row's height as your constraints dictate (so that the cell fits around your content). Instead, it keeps the row's height fixed and starts suggesting you change your constraints, which you should ignore. For example, imagine you've set up everything fine, no warnings, no errors, all works. Now if you change the font size (in this example I'm changing the description label font size from 17.0 to 18.0). Because the font size increased, the label now wants to occupy 3 rows (before that it was occupying 2 rows). If Interface Builder worked as expected, it would resize the cell's height to accommodate the new label height. However what actually happens is that IB displays the red auto-layout error icon and suggest that you modify hugging/compression priorities. You should ignore these warnings. What you can* do instead is to manually change the row's height in (select Cell > Size Inspector > Row Height). I was changing this height one click at a time (using the up/down stepper) until the red arrow errors disappear! (you will actually get yellow warnings, at which point just go ahead and do 'update frames', it should all work). * Note that you don't actually have to resolve these red errors or yellow warnings in Interface Builder - at runtime, everything will work correctly (even if IB shows errors/warnings). Just make sure that at runtime in the console log you're not getting any AutoLayout errors. In fact trying to always update row height in IB is super annoying and sometimes close to impossible (because of fractional values). Xcode 8.x / Xcode 9.x seems to (sometimes) be doing things differently than Xcode 7.x, but still incorrectly. For example even when compression resistance priority / hugging priority are set to required (1000), Interface Builder might stretch or clip a label to fit the cell (instead of resizing cell height to fit around the label). And in such a case it might not even show any AutoLayout warnings or errors. Or sometimes it does exactly what Xcode 7.x did, described above. To set automatic dimension for row height & estimated row height, ensure following steps to make, auto dimension effective for cell/row height layout. Set all constraints (top, bottom, right left) with respect to its superview/ cell container. Optional: Set minimum height for label, if you want minimum vertical area covered by label, even if there is no data. Note: If you've more than one labels (UIElements) with dynamic length, which should be adjusted according to its content size: Adjust 'Content Hugging and Compression Resistance Priority` for labels which you want to expand/compress with higher priority. Like @Bob-Spryn I ran into an important enough gotcha that I'm posting this as an answer. To have the storyboard instantiate all the additional elements obtain your cell with [tableView dequeueReusableCellWithIdentifier:@"DoseNeeded"] (Not [tableView dequeueReusableCellWithIdentifier:forIndexPath:] as this'll cause interesting problems.) When you do this all the elements you defined in IB will be instantiated. Another "solution": skip all this frustration and use a UIScrollView instead to get a result that looks and feels identical to UITableView. That was the painful "solution" for me, after having put in literally 20+ very frustrating hours total trying to build something like what smileyborg suggested and failing over many months and three versions of App Store releases. My take is that if you really need iOS 7 support (for us, it's essential) then the technology is just too brittle and you'll pull your hair out trying. And that UITableView is complete overkill generally unless you're using some of the advanced row editing features and/or really need to support 1000+ "rows" (in our app, it's realistically never more than 20 rows). The added bonus is that the code gets insanely simple versus all the delegate crap and back and forth that comes with UITableView. It's just one single loop of code in viewOnLoad that looks elegant and is easy to manage. 1) Using either Storyboard or a nib file, create a ViewController and associated root view. 2) Drag over a UIScrollView onto your root view. 3) Add constraints top, bottom, left and right constraints to the top-level view so the UIScrollView fills the entire root view. 4) Add a UIView inside the UIScrollView and call it "container". Add top, bottom, left and right constraints to the UIScrollView (its parent). KEY TRICK: Also add a "Equal widths" constraints to link the UIScrollView and UIView. You will get an error "scroll view has ambiguous scrollable content height" and that your container UIView should have a height of 0 pixels. Neither error seems to matter when the app is running. 5) Create nib files and controllers for each of your "cells". Use UIView not UITableViewCell. 5) In your root ViewController, you essentially add all the "rows" to the container UIView and programmatically add constraints linking their left and right edges to the container view, their top edges to either the container view top (for the first item) or the previous cell. Then link the final cell to the container bottom. The only "gotcha" I've found with this approach so far is that UITableView has a nice feature of "floating" section headers at the top of the view as you scroll. The above solution won't do that unless you add more programming but for our particular case this feature wasn't 100% essential and nobody noticed when it went away. If you want dividers between your cells, just add a 1 pixel high UIView at the bottom of your custom "cell" that looks like a divider. Be sure to turn on "bounces" and "bounce vertically" for the refresh control to work and so it seems more like a tableview. 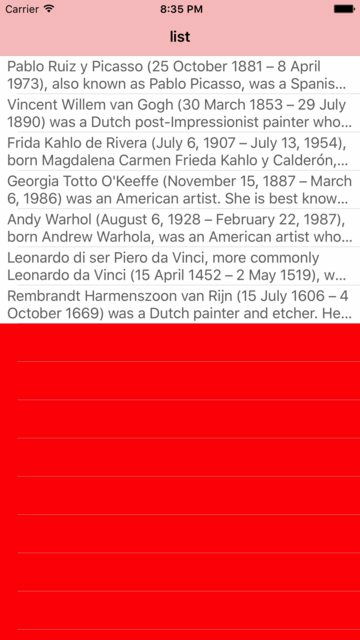 TableView shows some empty rows and dividers under your content, if it doesn't fill the full screen where as this solution doesn't. But personally, I prefer if those empty rows weren't there anyway - with variable cell height it always looked "buggy" to me anyway to have the empty rows in there. I had to use dynamic views (setup views and constraints by code) and when I wanted to set preferredMaxLayoutWidth label's width was 0. So I've got wrong cell height. After that label's width was as expected and dynamic height was calculating right. Let's say you have a cell with a subview, and you want the cell's height to be high enough to encompass the subview + padding. 1) Set the subview's bottom constraint equal to the cell.contentView minus the padding you want. Do not set constraints on the cell or cell.contentView itself. 2) Set either the tableView's rowHeight property or tableView:heightForRowAtIndexPath: to UITableViewAutomaticDimension. 3) Set either the tableView's estimatedRowHeight property or tableView:estimatedHeightForRowAtIndexPath: to a best guess of the height. If you do you layout programmatically, here is what to consider for iOS 10 using anchors in Swift. NUMBER 1: set this two properties of tableview on viewDidLoad, the first one is telling to the tableview that should expect dynamic sizes on their cells, the second one is just to let the app calculate the size of the scrollbar indicator, so it helps for performance. NUMBER 2: This is important you need to add the subviews to the contentView of the cell not to the view, and also use its layoutsmarginguide to anchor the subviews to the top and bottom, this is a working example of how to do it. Create a method that will add the subviews and perform the layout, call it in the init method. If you do it you will override your implementation. Follow this 3 rules for dynamic cells in tableviews. If you have a long string. e.g. one which doesn't have a line break. Then you you might run into some problems. I find Suragh's answer the most complete and concise, hence not confusing. Though non explain why. Let's do that. Drop the following code in to a project. Note that I haven't added any size constraints. I've only added centerX, centerY constraints. But still the label will be sized correctly Why? To better process this, first keep step0, then comment out out steps 1-6. Let setupLayout() stay. Observe the behavior. Then uncomment step1, and observe. Then uncomment step2 and observe. Do this until you've uncommented all 6 steps and observed their behaviors. What can conclude from all this? What factors can change the contenSize? Font Size: Also note that if you increase your fontSize then the intrinsicContentSize's height will increase. I didn't show that in my code. You can try that on your own. There is no need to set preferredMaxLayoutWidth. 1. No use of automatic row height calculation property. 2.No use of estimated height 3.No need of unnecessary updateConstraints. 4.No use of Automatic Preferred Max Layout Width. 5. No use of systemLayoutSizeFittingSize (should have use but not working for me, i dont know what it is doing internally), but instead my method -(float)getViewHeight working and i know what it's doing internally. Is it possible to have differing heights in a UITableView Cell when I use several different ways of displaying the cell? It's suggested that you do your best to get the correct estimate, but the end result isn't different. It will just affect your performance. If you set the estimatedRowHeight to 1 or smaller then you will crash regardless of the rowHeight. Simply add these two functions in your viewcontroller it will solve your problem. Here, list is a string array which contain your string of every row. @IBOutlet weak var tableViewHeightConstraint: NSLayoutConstraint! Not the answer you're looking for? Browse other questions tagged ios uitableview autolayout nsautolayout row-height or ask your own question. How to animate UITableViewCell height using auto-layout?